Votive Candles have a glass holder filled with poured unscented white wax. Assembly is required—instructions included. The personalized belly band has a die cut slit with a flap that is inserted into the slit for easy assembly. Form bands and then slide candle into band with the base of the candle going through first. Personalize your Votive Candles with text and illustrations from our extensive, designer-curated collection. With over 100 paper colors, 150 fonts, 50 foil colors and 1,300 clipart images, you can create the perfect party accessories for your event. You also have the option to Upload Your Own Art for a truly unique product. 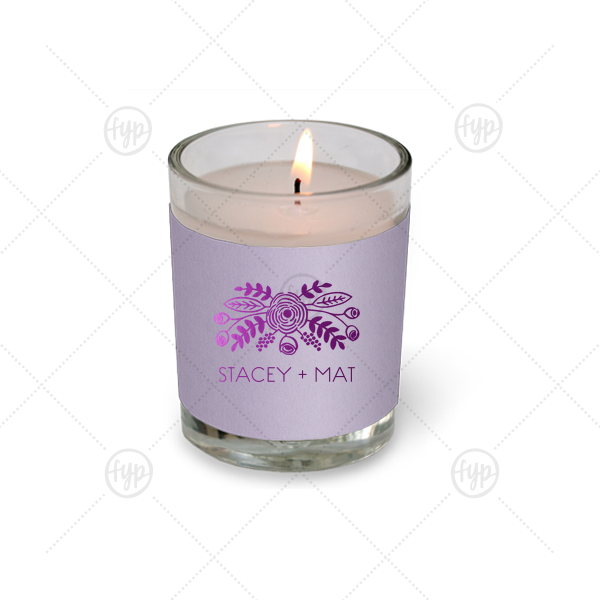 ForYourParty's chic Poptone Lavender Votive Candle with Shiny Amethyst Foil Color has a Rustic Floral Accent graphic and is good for use in Accents, Wedding, Anniversary themed parties and will look fabulous with your unique touch. Your guests will agree!